Happy new week to you all. 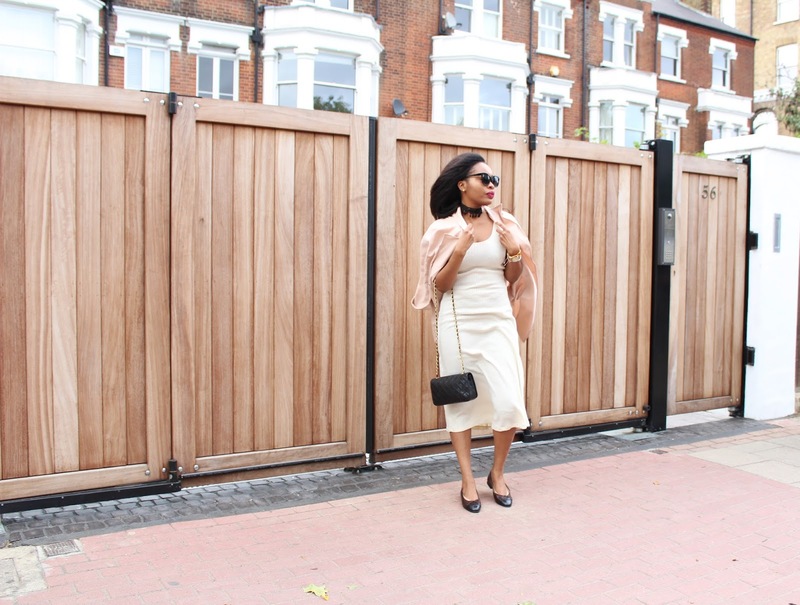 Today's style post is a look I wore while I was in London last month. I had the chance to hang out with two of my other blogger babes Luna from Swagga Is My Thing and Barbara from Out Of Barbara's Box. These ladies were so good to me and showed me an amazing time. It was my first time meeting them (offline) and it felt like I knew them forever. This blogging world is such a beautiful thing and we use it wisely we can build great relationships with our readers, other bloggers and everything that comes with it. We spent the afternoon in Clapham hoping from wine bar to wine bar and enjoying some really good wine. To be honest, I didn't write down any of the names of where we went but the local area of Clapham has great choices should you go to London. The girls and I giggled giddily over funny conversations and talk about general stuff bloggers care about-trends, shoes, clothes, places to travel etc. My dress and coat are for from Zara. I picked them up while I was in London because I did not bring any cold weather clothes with me and this particular day was cold and rainy. Sometimes our photos come out so crisps and lovely and our lives looks perfect but most times it is far from that. If I were to tell you that under this dress I had on my workout tights (for extra warmth) that I had to pull up to my knee caps-and it was squeezing the life out of me. Haha! When it warmed up, I quickly snatched that thing off and stuffed it in my handbag. I paired my midi semi-fitted dress with my Chanel cross body bag and my comfy Chanel flats. Added the choker for a touch of edge and went for bold lips. I hope you enjoyed these photos as much as I enjoyed my afternoon with Barbara and Luna. Oh, you were having too much fun and the wine...and the drop dead gorgeous friends... With the 3 of you in the wine bars, the guys were not concentrating on the wine...I assure you! Was it Barbara or Luna who wore the gold slip on shoes? I want them..send them! over. Great pics! And I loove the new blog layout!! Beautiful post! I loved it babe!